Dear Hoya Friends – I was wrong. For the past 30 or more years I have been telling people that the name Hoya cystiantha was not validly published and, therefore, there was no such hoya as Hoya cystiantha. I even quoted the late Hon. Douglas H. Kent and David Goyder. Recently, I read that the name is valid because the Code, at the time that Schlechter wrote the one partial sentence where he mentioned that name, was considered valid. What’s wrong with Fraterna 23(4): (2010) ? What isn’t wrong with it? Hoya apoensis var. sagittarius Kloppenb. Siar et Ferreras in Fraterna 23(4):5-8 (2010). I don’t know if there is a law against it but I think it abominable that a varietas of a species is published before the type of the species. The species type is rumored to appear in Asklepios in 2011. Gimme a break! Mathematics was never my best subject (I think I inherited a math deficiency from my Hornsby ancestors) but it doesn’t take a degree in mathematics to figure out that if the top calyx picture shows a calyx 11 times larger than life that the calyx in the bottom picture is 22 times larger than life. I say that because I measured and compared sizes of every part of each calyx. I found every part of the bottom calyx was almost exactly 2 times larger than those in the top picture. The only case I know of where one adds one and one and doesn’t get two for an answer is when one and one say vows, before God and man, just before escaping in a car with a “just married” sign and a collection of rusty tin cans trailing from the bumper. That’s when one plus one, adds up to ONE! Not having any flowers of my own to compare with those pictured, I can’t say anymore about the accuracy of the rest except to say that Kloppenburg’s description of the flower colour is that the flowers are “rose red.” A picture found on page 7 shows an umbel of 19 very pale pink flowers with white coronas. In a medical journal that I found on the coffee table in my doctor’s waiting room, I read and article that said, “All men are colour blind to some degree. I suspect that Mr. Kloppenburg suffers from more than “some degree.” I think suspect he may be colour blind to a large degree--- either that or I am! Above left: Outline of a leaf of the size and shape described by Kloppenburg. That sketch doesn’t look that size on my screen but it is the size my figures indicate. Above right: The largest of the leaves in the cover picture of Fraterna 23(4): (2010). The thing that makes me believe that the leaf on the right measures approximately 4 cm. is because Kloppenburg said that the corolla measures 0.43 cm. from apex to center. Multiply that by 2 and you’ll find that the corolla measures 8. 6 mm. in diameter. 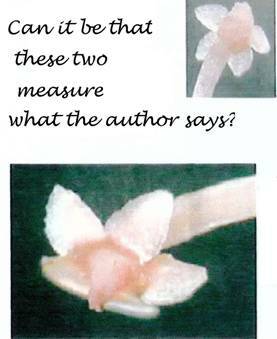 It is next to impossible to measure flower parts in a picture without a scale in the picture but the cover picture of the species in question shows flowers of approximately the size cited, or slightly smaller. This tells me that if the flower size is close to accurate in that photograph, then the leaves in the same photograph are the approximate size of leaves on a living plant. In addition to that, a greatly reduced picture of the holotype specimen was included with this publication. Having examined specimens in a dozen herbaria, I know that dried species are mounted on Bristol Board or other similar acid free paper that measures 11 X 14 inches, give or take and inch or two in each direction. A rough guess is that the picture of this specimen is ¼ life size. The largest leaves in the picture measure 1 cm. long. Multiply that by 4 and you get 4 cm. long leaves. Fraterna 22(4) contains an attempt to publish a new hoya name. That name is Hoya paulshirleyi T. Green & D. Kloppenburg. There are two problems with that publication, which, I’m sure scores of people were quick to point out. The publication wasn’t valid because it didn’t contain a Latin diagnosis. As a matter of fact, it didn’t have a single Latin word in it. The cited holotype specimen is a Paul Shirley number, which is 8844. Either the authors, or the prone to error editor, left the IPPS/GPS-prefix off of that number. It should have read IPPS-8844 or GPS-8844 (GPS & IPPS, plus numbers represent the same species). IPPS/GPS-8844 is Hoya dolichosparte Schltr. It was acknowledged as that in Blumea 46: 472 & 473. The authors of that publication are D. Kleijn and R. van Donkelaar. 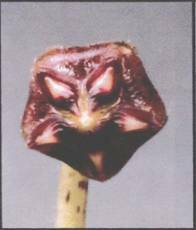 Their illustration shows flowers that exactly match those on R. Schlechter’s holotype specimen of Hoya dolichosparte. 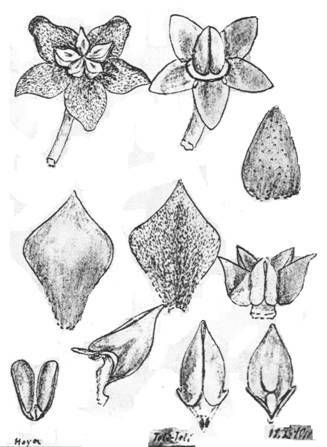 Above: Schlechter’s sketches of the various Hoya dolichosparte flower parts. Above right (& below the Green & Kloppenburg calyx): Schlechter’s Hoya dolichosparte calyx. You can see some wart-like hairs on the outside of that single sepal but their isn’t a cilia to be found on any of the sepals. Above left: Green and Kloppenburg’s corona lobe in profile. Above right: Schlechter’s Hoya dolichosparte corona lobe in profile. I could continue and show you several additional flower parts for comparison but I think this is enough to prove the point I’m trying to make, which is that the hoya in volume 22, #4 of Fraterna was not what the authors’ claimed. So, where does Fraterna 23(1) figure in this puzzle? The answer is that someone woke up and realized that the vol. 22 publication wasn’t valid and they thought it lacked only the required Latin diagnosis. They wrote one. IHA dues payers have now had to pay for 10 pages of print (unless they were reimbursed by whomever is responsible for those errors, which would be the honorable thing to do)or will they again have to anti-up for another 5 pages? For heaven sake, IHA members, demand that your leaders SAVE OUR TREES!!!!!!!!!! They say that data found on computers are only as reliable as what someone puts in them. I suspect that Wayman is much like the computer and that what she types is only as true as what Kloppenburg and others give her. What Hoya is Hoya plicata King & Gamble? Maybe I’m just “runingdum” (pun intended) but I think a variety of a subspecies should look a whole lot like the species type. The hoya recently published by Ted Green with flower part illustrations by Torrill Nyhuus and pollinaria by D.K. Kloppenburg don’t appear to me to fit King & Gamble’s type nor their description. 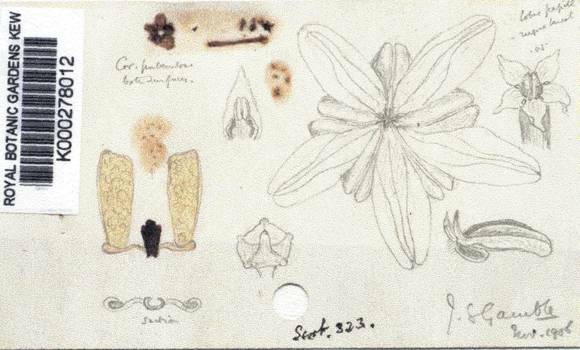 Above: Gamble’s sketch’s of the flower parts of Scortechini’s specimen #323, which is King and Gamble’s designated Hoya plicata holotype. Gamble drew this sketch using the flower parts attached to this sheet. Let us do some comparing. Above left: Calyx & carpels of the Rundum species, which Mr. Green says is a subspecies of Hoya plicata. 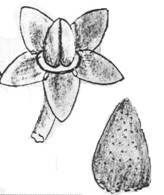 Above right: Sketch of calyx and carpels by James Sykes Gamble, found on the Hoya plicata holotype (Scortechini’s #323). Note the short triangular shape of the sepals on the Rundum species and their obtuse tips. Compare those with the acuminate and acute sepal tips in Gamble’s sketch. Note also that King and Gamble, in the Hoya plicata name publication, described the calyx lobes as being acuminate. The Rundum species’ calyx does not fit. Above left: A single flower of the Rundum species, showing the corona and its various parts. Above right: Gamble’s sketch of the Hoya plicata corona that he found on Scortechini’s specimen 323. Note the very narrow anther wings between the corona lobes in the picture on the left. They are practically invisible. Note the large, very fat anther wings between the corona lobes in Gamble’s sketch. Gamble had an actual corona to use as a model. 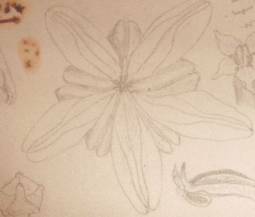 Note, also that Gamble’s sketch shows the inner apexes of the corona lobes meeting in the center of the flower, completely covering the anther appendages. 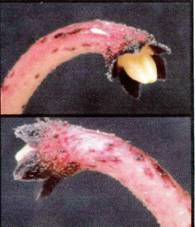 That agrees with King’s and Gamble’s text, which said that the upper lobe was “as long as the anthers.” The inner (or upper) corona apexes of the Rundum species do not meet in the middle, leaving a lot of the anther appendages exposed. 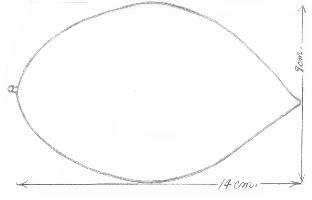 Note also the elongated central part of each corona lobe, how the elongated parts are almost equal length with the upper, broader part and the outer apex is acute. There is also a line extending the entire length (right down the center) of each lobe, marking what King and Gamble described as “a broad fold on the upper surface.” This fold, no doubt, was the authors’ inspiration for the name plicata, which means, “pleated.” In his manuscript on the three species, micrantha, revoluta and plicata, David Liddle expresses the belief that the name came from folds found on some mature leaves, however, I doubt that because King and Gamble did not mention folded leaves. They described the leaves as “smooth and glabrous on both surfaces; margins slightly recurved; 3 inches long, 1 inch broad; midrib very faint and then only when dry; remaining nerves invisible.” My Rundum species’ leaves are glabrous but not smooth. 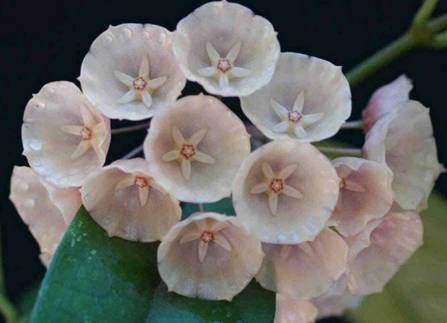 The most unusual feature described by King and Gamble in their Hoya plicata name publication is the corolla. They said that the corolla is “puberulous on both surfaces.” I may have missed or forgotten something I read about other hoyas but I don’t recall any other hoya description noting a corolla that was puberulous on both surfaces. Most are puberulous inside and glabrous outside. 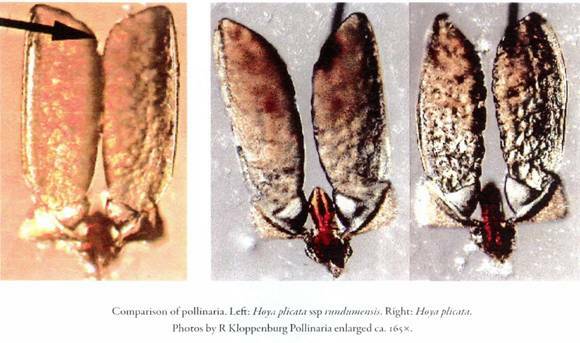 Above: The one on the left, so the caption says, is a pollinarium of the Rundum species and the other two are said to be pollinaria of Hoya plicata. Note the upper tips of the pollinia in all three pictures. Compare them with the upper tips of the pollinarium shown below. Do they match? Heck no! The two pollinaria on the right are good matches to those of Hoya revoluta. None of the pollinia are truncate at their tips as they should be if they were Hoya plicata pollinaria. 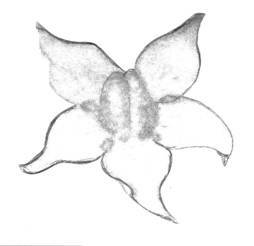 Above: Gamble’s sketch of the pollinarium he found on the Hoya plicata type. Some time ago, David Liddle sent me a copy of a manuscript of his which, when published, will (with a few minor changes) straighten out the colossal Hoya revoluta/Hoya micrantha/Hoya plicata identification muddle! He knew that I’d been claiming that the hoya sold to me in US trade as Hoya revoluta was not that species. He knew also that I was totally convinced that the hoya sold by Mr. Kloppenburg as Hoya plicata was not that species. He also knew that, I still bought the old timers’ opinion that Hoya plicata was just a synonym for Hoya micrantha. I was wrong on that, as were a lot of more qualified hoya researchers before me. I have confirmed, with David Liddle’s help, that IML-1455 is correct for Hoya revoluta but I have not had flowers of the other IML numbers to study. Please don’t get too comfortable with the name Hoya plicata subsp. rundumensis because the plant you were sold with that label is something else. Retain the number that was on it when you got it. I got it as Dischidia-93039 (from Ted Green) and, later as IML-557 (from David Liddle).